Isuzu is launching the most extreme D-Max to bolster its already comprehensive model line-up. The new Isuzu D-Max Arctic Trucks AT35 is engineered to excel in the most arduous terrain, whether in the wilds of the British countryside or on building sites in the city. Available in either double-cab or extended-cab configurations, the AT35 is the most extraordinarily capable pick-up that Isuzu UK has ever put on sale. It is priced from £30,995. 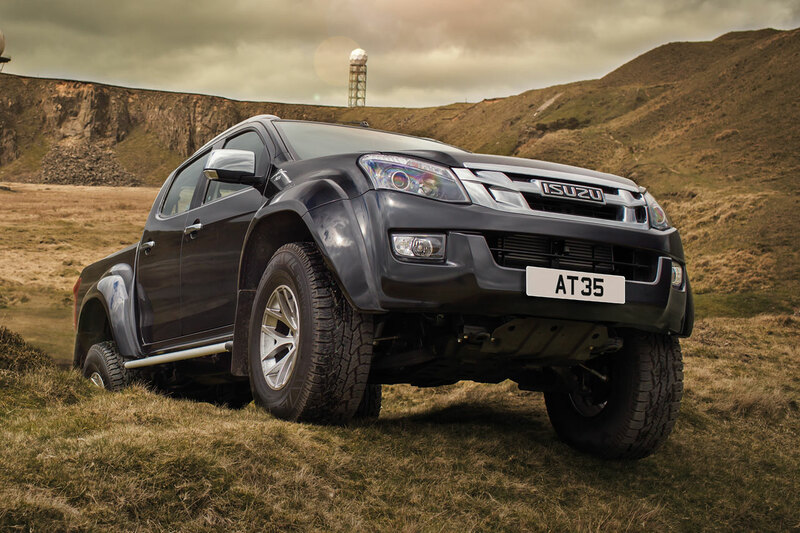 Standing out from the crowd in terms of both its unprecedented off-road capabilities as well its aesthetics, the AT35 builds on the strong and durable platform of the multi-award winning D-Max. In addition to the high levels of standard equipment, a comprehensive accessories list allows customers to spec their AT35 according to their unique requirements. Arctic Trucks is a vehicle engineering specialist, developing and building 4x4 vehicles able to conquer the most challenging conditions for over 25 years. The Isuzu D-Max Arctic Trucks AT35 will be the first Arctic Trucks pick-up in the UK that can be ordered directly from a vehicle manufacturer’s dealer network. The AT35 retains the impressive one-tonne payload and 3.5-tonne towing (braked) capacities that have helped keep the Isuzu D-Max one of the most popular pick-ups for those seeking an exceptional workhorse with low running costs. The extended-cab body was designed from the ground up as an ‘open-cab’ pick-up. To create this space-making design, Isuzu’s engineers developed a second-row, rear-hinged door, also known as the side-access panel (SAP) on each side of the vehicle. To ensure maximum strength, and safety in the event of a collision, the engineers incorporated a one-piece B-pillar into the leading edge of the side access panels. The result is uninterrupted access to the side of the cabin, ideal when loading large items behind the front seats. The side access panels can be opened from both inside and outside the vehicle. The rear seat cushions fold down from the back panel, creating additional seating, with fold-out thigh supports offering occupants even greater levels of comfort. While the AT35 can haul more than a tonne of on-board cargo and up to 3.5 tonnes in a braked trailer (where the terrain allows) – just as its D-Max stablemates can – as well as traverse more extreme topography than ever before, passengers remain as well catered for as ever in the refined and well-appointed premium D-Max interior. Just as the interior shields occupants from potentially harsh and hazardous conditions outside, it provides entertainment with a six-speaker audio package with an ‘Exciter’ speaker in the roof lining, plus iPod/USB/Bluetooth connectivity to provide high-quality sound. Comfort is assured thanks to heated and folding door mirrors (including side indicator repeaters) and a leather steering wheel with audio and cruise controls provides additional safety and convenience. The double-cab model also includes full leather upholstery for an even more luxurious interior, as well as automatic climate control air-conditioning. This is controlled by a large, circular Heating, Ventilation and Air Conditioning (HVAC) selector located on the cabin’s centre console, which allows occupants to control temperature and fan settings with a single dial. The system automatically maintains the set temperature for optimal passenger comfort. Buyers will have the opportunity to choose from a range of optional accessories to further enhance the interior, the practical functionality and the visual impact of the AT35. 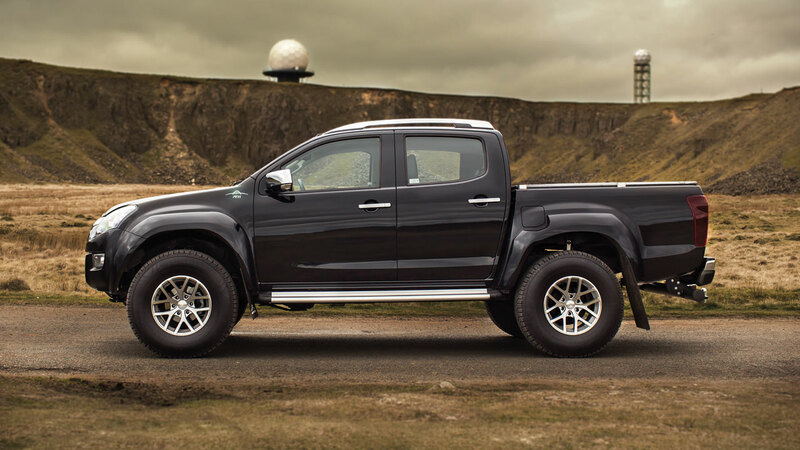 Styling upgrades include an Arctic Trucks Truxedo that provides added security for cargo in the load bed, as well as the Arctic Trucks Sports Bar for improved styling. Furthermore, off-road extras such as a 27-LED square work light can provide widespread illumination under the darkest skies, skid plates provide enhanced under-body protection, and an ARB tyre inflator with inline gauge help the most adventurous continue on their way. Customers opting for the double cab AT35 can also upgrade their infotainment system with the Pioneer AVIC-F860BT audio set-up, DVD and European navigational system with 6.1-inch touch screen, reversing camera and Parrot Bluetooth kit for wireless telephony and music streaming. The AT35 is based on the same tough and durable chassis of the Isuzu D-Max chassis. It is made of high tensile strength steel with cross-member braces to ensure exceptional torsional rigidity and large cross-sectional dimensions for a strong and stable structure. Additional cross braces aid torsional rigidity and also spread the weight of payloads evenly, enhancing the vehicle’s laden handling balance, both on- and off-road. Under the bonnet of the D-Max Arctic Trucks AT35 is the highly-efficient 2.5-litre twin-turbo diesel engine that delivers 163 PS and 400 Nm torque for all models in the D-Max line-up. 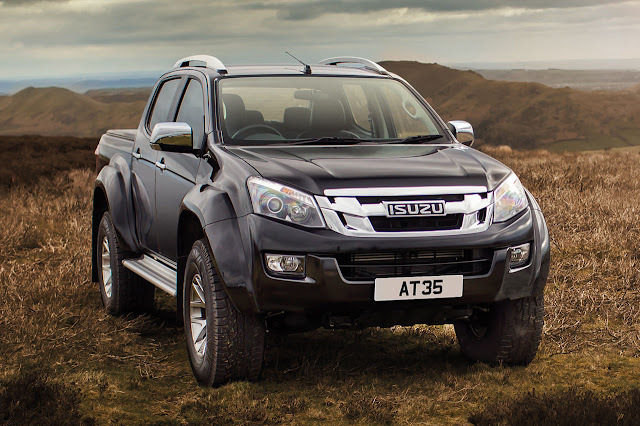 Isuzu offers the largest range of automatic pick-up models on the market and buyers of the double-cab AT35 can also select auto transmission. The five-speed automatic features sequential manual shift control so that drivers can take direct control of gear selection for a more engaging experience – or allow the transmission to operate fully automatically to suit their mood and the terrain. A shift-on-the-fly two- /four- / low-ratio four-wheel drive selector dial is located on the centre console. The system allows drivers to switch between two-wheel drive and high-ratio four-wheel drive at speeds up to 60 mph (100 km/h). Low-ratio four-wheel-drive can be engaged while stationary with the transmission in neutral, and, combined with other Arctic Trucks enhancements, means the AT35 can crawl up and over almost anything it finds itself in front of. Despite being the most capable pick-up ever to be launched onto the UK market, buyers and operators will benefit from the same ultra-low running costs that all Isuzu D-Max owners enjoy. This is thanks to a competitive 42E insurance rating, low-cost finance packages and a comprehensive three-year / 60,000 mile warranty package. In addition, costs are kept low by 12,000-mile or 24-month service intervals, three years recovery and assistance cover, a three-year paint warranty, and a six-year anti-corrosion warranty. Isuzu UK repeatedly breaks its own sales records, with 6,220 vehicle registrations in 2015 – up 13% compared to the previous year. This record performance represents the sixth year of sales growth and the third consecutive annual sales record for the brand in the UK, marking a 478% improvement over the 1,076 vehicles registered in 2009. This dramatic and sustained rise in deliveries can be attributed to the appeal of the multi-award winning D-Max pick-up, launched in the summer of 2012 and now available in six trim levels. 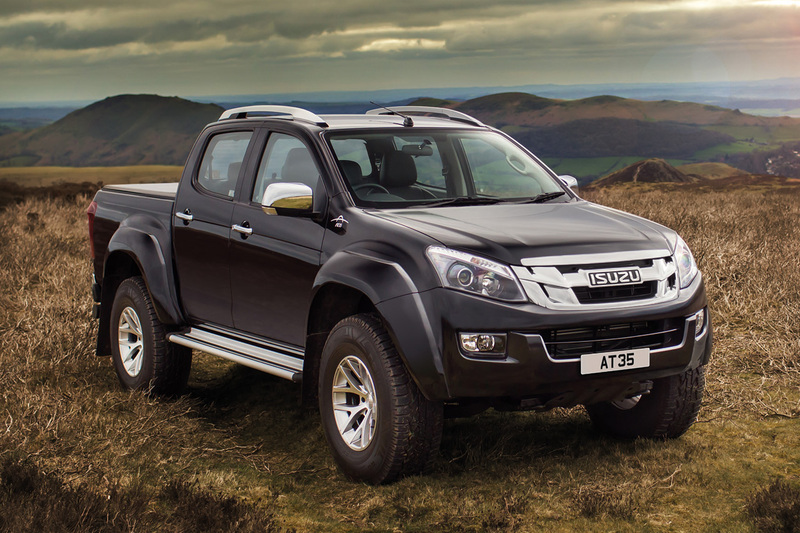 Isuzu UK’s success has resulted in the UK becoming the company’s number one market in Europe. Isuzu’s sustained and impressive growth in the UK is representative of the global successes achieved by the brand year after year, all of which is founded on a rich history of accolades and world-first accomplishments. This year Isuzu is proud to be celebrating its centenary, marking 100 years since the company set up operations in Tokyo, Japan.